How Chlorine Degradation Impacts New Home Performance | Lubrizol Advanced Materials, Inc.
Polyolefin materials include polypropylene, polyethylene, EPDM rubber, polybutylene and PEX, which can be found in pipes, gaskets and o-rings, and toilet flappers in domestic plumbing systems. Most water treatment facilities use chlorine-based disinfectants such as chlorine, chlorine dioxide and chloramine, to keep our drinking water safe. Unfortunately, water utilities are only responsible for keeping the water safe to drink, they aren’t responsible for any damages their disinfectants might cause. Toilet flappers are commonly manufactured from a polyolefin rubber, such as EPDM. 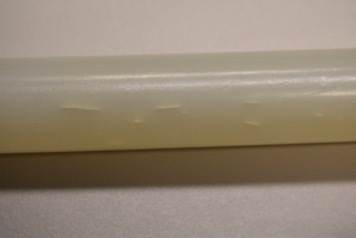 When these polyolefin rubbers come into contact with chlorine, the material begins to break down and results in surface cracking and distortion. When that happens, the flapper is no longer able to form a seal in the tank, which results in the toilet periodically running to refill the tank. In a new home, the situation inevitably results in a builder warranty call. While toilet flappers do not operate at elevated temperatures or pressures, they can fail when exposed to high levels of chlorine, which may come from the municipal water supply or, most commonly, through the use of chlorine tablets. While toilet flapper degradation is rare in the absence of chlorine tablets, domestic plumbing systems are designed to operate in hot water and at elevated pressures. Unsurprisingly, when polyolefin materials were used in domestic plumbing systems in the past, many failures occurred and resulted in over $1 billion in class-action lawsuit settlements. Polybutylene was the first polyolefin piping material used in domestic plumbing systems. Following widespread failures in the 1980s and early 1990s and one of the largest class-action settlements in U.S. history, the material was removed from U.S. plumbing codes. Today, three polyolefin materials are used in domestic plumbing systems: Polypropylene, PERT and PEX. While PERT is a newcomer and has been used fewer than five years in the United States, Polypropylene and PEX have each faced several high-profile failures, including at least 10 class-action lawsuits on PEX plumbing systems. Besides water chemistry, temperature and pressure play a significant role in how polyolefin materials will respond to chlorine exposure. This is why polyolefin piping failures tend to show up on the hot water side first. While these temperatures and pressures are not typical in homes, they are not uncommon. Many areas of the country routinely have street pressure that exceeds 80psi, and warm climate areas may see ambient attic temperatures above 140°F during peak summer months. The materials used in plumbing systems must be able to withstand ongoing exposure to the chlorine-based disinfection used in our drinking water. FlowGuard Gold® CPVC is 100% immune to chlorine degradation in domestic plumbing systems because it is a chlorinated material. The presence of chlorine in CPVC’s molecular structure ensures that a FlowGuard Gold CPVC plumbing system will never experience chlorine degradation in situations where polyolefin materials like PEX, Polypropylene and PERT can fail. FlowGuard Gold CPVC has been used in American plumbing systems for 60 years, with more than 11 billion feet of pipe installed. Despite its extensive use, CPVC is the only plumbing system material without any class action lawsuits. FlowGuard Gold CPVC’s resistance to chlorine degradation provides builders and installers peace of mind that the plumbing system will not fail when exposed to chlorine in normal drinking water. If you’re currently using a polyolefin piping material, contact us to speak to a representative and learn how to make the switch to the superior plumbing system.